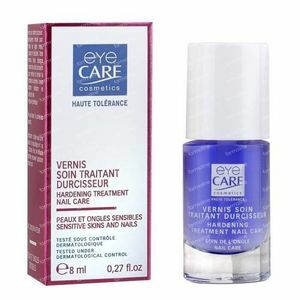 Eye Care Nail Hardening Treatment 805 8 ml order online. Specially formulated for soft, brittle and split nails, this treatment contains silica and an active ingredient to harden and strengthen nails. Free from fragrance, toluene, formaldehyde, rosin, preservatives, paraben and nickel (microbeads). Often used as a hardening base before applying varnish.